SFK makes daily tasks easy. Find and extract text in binary files, list dir tree sizes, filter and replace text, run an instant ftp server, http server for easy file transfer, find duplicate files, join many text files into one, create and verify md5 checksum lists, run a command on all files, detab text, create hexdumps from files, trace contents of a tcp connection, find dependencies between files, print colored text to terminal, locate commands in the path, print last lines of a file, convert CR/LF, hex to binary, binary to source code, split and join large files, list the contents of all .zip .jar .tar.gz and .tar.bz2 files. Example: how do you transfer files from one PC to another? type "sfk ftpserv", and you have an ftp server running within one second. The same with all other functions: "sfk find" finds text within files - without long and boring index creation. 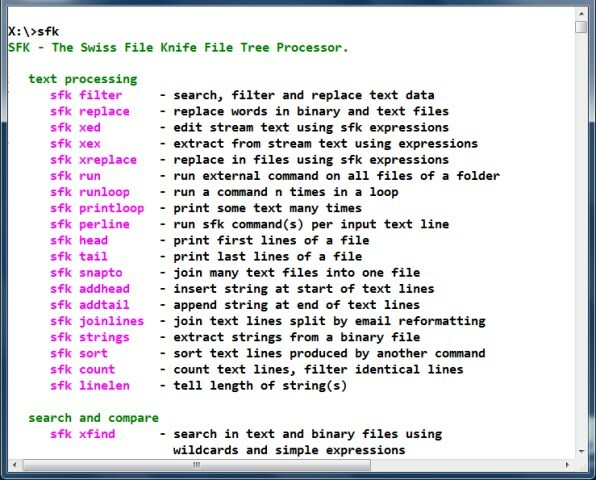 "sfk run" runs your self-defined command on all files, but you get a preview of what would be done before the stuff is really executed. Detailed help and easy syntax: whereever possible, there is a descriptive help text, understandable error message, suggestion for improvement. Options are written in plain english - it's no longer "ls -lRxtz -bnf" geek speak, but "sfk list -time -size -since today", commands that you can actually remember. No installation: if you are working on many different machines (bussiness and private PC, notebooks, VMWare machines, helping someone under Windows and Linux) then forget about installing tools over and over. No installation, registry modifications, DLL dependencies - SFK simply runs instantly, anywhere. Download URL points to the Windows version. For Mac OS X, Linux, Raspberry Pi use the tool website. improved sfk name and rand. bugfix for simple expressions using ortext.